UPDATE: I made a few corrections to this post after publication, which are in bold. With fewer houses and a reconfigured layout, Chelsea Court, a proposed townhouse development less than a block from downtown Silver Spring, got the nod from MoCo's hearing examiner, bringing it one step closer to reality. The County Council next has to approve the project, and they should. Townhomes like these at Clarendon Park in Arlington could soon becoming to Silver Spring. Two years ago, Bethesda-based developer EYA bought planned a development on the five-acre Chelsea School campus at Pershing Drive and Springvale Road after the school decided to move. 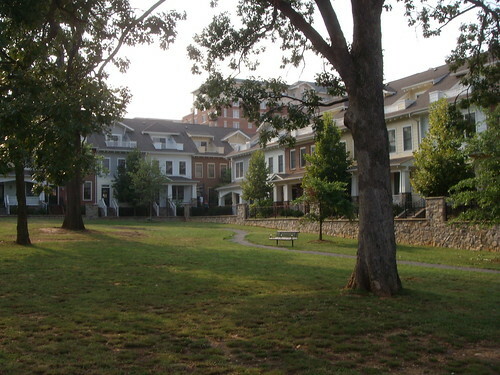 Noting the site's proximity to the Silver Spring Metro and demand for transit-accessible housing, EYA sought to have the site rezoned from R-60, which allows single-family homes, to RT-15, which allows townhouses. The zoning change was approved by the county Planning Board, which pointed to the twelve-story Colesville Towers apartments across the street and said townhouses weren't too dense for the neighborhood. Then it went to the County Council, but they rejected the zoning change due to opposition from residents only want single-family homes in their neighborhood. The County Council asked EYA to come back with a new proposal, and they did, which was just approved by the Hearing Examiner, Lynn Robeson, who basically serves as a judge for the county's zoning code. The examiner's office released this 111-page report detailing how they came to their conclusion. The originally proposed site plan. The site will now be zoned RT-12.5, which still allows townhouses, but at a lower density. There will be only 64 townhouses, instead of 77 as EYA first proposed, while the number of county-mandated moderately-priced dwelling units will drop from 13 10 to 8. 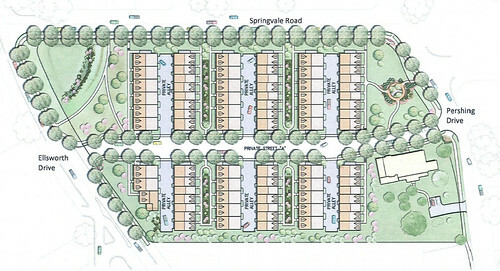 The houses will be placed further away from Springvale Road to appease residents of that street, while a private street for the new development has been moved. Because of these changes, half of the site is set aside as open space, including wider courtyards between townhouse rows and a larger park at the corner of Springvale Road and Pershing Drive. There's also more open space around the historic Riggs-Thompson House, which was built by the founder of Riggs Bank was originally going to be saved in the first proposal. Nonetheless, some neighbors weren't satisfied. No fewer than six civic associations opposed the project, including the adjacent Seven Oaks-Evanswood Civic Association (SOECA), but also Lyttonsville and South Four Corners, both of which are several miles away from the site. Residents complained about the loss of large trees, while others questioned that EYA's traffic studies showing no increase in nearby congestion. SOECA president vice president Vicki Warren said there wasn't enough open space around the Riggs-Thompson House, though historic preservation planner Judith Christensen said she could "live with" what was provided because the county's Historic Preservation Commission would have a say in how it was used. Many complained that the project's layout resembled military barracks, though the "alternative plan" submitted by Kenneth Doggett, SOECA's "expert land planner," looks much like EYA's proposal, but with fewer houses. Doggett's proposal for the Chelsea Court site. In response, EYA tried to show how Chelsea Court fit into the local context. Vice president Aakash Thakkar displayed a model of Clarendon Park, a project they built in Arlington with a similar layout, and noted how the end houses were designed to look like single-family homes, helping them blend into the neighborhood. Miguel Iraola, a planner at Hord Coplan Macht who's designing the project, offered several precedents throughout Silver Spring, Wheaton and Bethesda that are similar in design or density to their proposal. Neighbors Maria Schmit and Tom Anderson claimed that they weren't comparable to Chelsea Court, but Robeson agreed with Iraola's conclusion. With the hearing examiner's approval, the new Chelsea Court proposal will now go before the County Council once again, and I hope they approve it as well. EYA has worked hard to meet the neighborhood's concerns, crafting a project that not only respects the site's history but its current surroundings. They also have a good track record for creating quality infill projects, which many neighbors recognize. “Based on EYA’s National Park Seminary [in Forest Glen], I am convinced this new development will be attractive – just as attractive as our existing neighborhood and perhaps even more so,” wrote SOECA resident Leslie Downey in a letter to the Planning Board last year. Many Silver Spring residents say they want to support local businesses, are upset about traffic congestion, and are concerned about safety. Yet they are often the same ones who oppose projects like Chelsea Court, which would generate more customers, allow more people to walk, bike or use transit instead of driving, and provide more "eyes on the street." We could do far worse than this. Chelsea Court has been fully vetted and dutifully revised, and now it's time to get it built. "county-mandated moderately-priced dwelling units will drop from 13 to 8"
I'm pretty sure it dropped from 10 to 8 (77x.125=9.625). The Council better approve the proposal. EYA has been more than generous with the NIMBYs. My b. I fixed it! I believe it was the hearing examiner who rejected EYA's initial plan, not the Council. You write from the perspective of a young adult who is still moving around and not settled down. You lack the perspective of people who are older and have made the largest purchase of their lives: in this case, people who bought homes in the Seven Oaks/Evanswood neighborhood, expecting a certain level of density for a community they plan to live in for the next several decades, where they will raise families and perhaps even stay until they die. If the Council approves this development, then the Council will betray the trust of the residents of Seven Oaks/Evanswood. The Master Plan for North and West Silver Spring explicitly reaffirmed the existing zoning in residential neighborhoods like Seven Oaks/Evanswood. The fact that the Planning Board eagerly rubberstamped EYA's RT-15 proposal, and then its RT-12.5 proposal, demonstrates how deep in the pocket of developers they are, along with their complete disregard for the county citizens they ostensibly serve. Even at RT 12.5, this will be the most dense townhouse development in North Silver Spring. It will dump up to 120 cars into a quiet residential neighborhood of single family detached homes and quiet streets. EYA plans to cut down 77 trees, many of them tall and mature and perhaps 100 years old. How is that "Smart Growth"? Its plan infringes upon the traditional historic setting of the Riggs Thompson House, and it will create an imperviously surfaced heat trap where there is now grass and trees. It has no place in Seven Oaks/Evanswood, and if it wasn't for the greed and arrogance of the Planning Board, it wouldn't even be considered. Seven Oaks/Evanswood is beautiful and valuable precisely because it is a low density, green neighborhood. "Chelsea Courts" at RT 12.5 will destroy part of what makes the neighborhood so beautiful, for the profit of people who do not live in it. SOECA scored a significant victory in its David versus Goliath fight against EYA when it stopped EYA from its disastrous RT-15 plans. The County Council hearing was a bad joke, as it was clear that the pro-EYA Councilmembers didn't even bother to read the Hearing Examiners' report and voted based on their own craven interests. Don't buy for a second their stated concern for MPDU's; do buy their concern for contributions from developers, however. If you don't believe that, then consider that EYA can have the same number of MPDU's under a lower RT zoning level, if they wanted to. If that's what the Council really cares about, then let them choose something lower than RT-12.5 (don't hold your breath). That SOECA managed to win was a miracle, given the combination of willful ignorance and greed displayed by so many of the Council members. "Smart Growth" sounds good in theory, but it has become a ruse used by developers to justify high density development that is not compatible with existing neighborhoods. It is a bad lie, in other words, like so much other propaganda. SOECA has fought, and continues to fight, the good fight. If the allegedly liberal and progressive County Council chooses to side with an outside developer over the needs and concerns of the people they are paid to represent, then it will be to their everlasting shame. The Council voted 5-4 to reject EYA's plan. You write from the perspective of a young adult who is still moving around and not settled down. You lack the perspective of people who are older and have made the largest purchase of their lives. Well, color me patronized. I'd be happy to respond to your generalizations about me and my life with some generalizations about yours, but I'll let you in about me first. 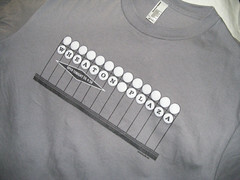 I grew up in an apartment building in downtown Silver Spring in the 1990's. I know what it used to be like. My family moved away because even when prices were reasonable, neighborhoods like yours were still out of reach to them. But I love coming back to downtown Silver Spring because of all the great stuff we have down here: restaurants, shops, jobs, parks, and so on. And, of course, the Metro. I don't want to generalize about you, but I know you live within a mile of a Metro station and within walking distance of all those great things I just mentioned. Those things are not supported solely by your "low-density, single-family neighborhood." You need more people, some of whom will live in apartments (as my family did) and townhouses (like your potential new neighbors in Chelsea Court). Those things are why your house is so valuable and why others want to live in your neighborhood. Call me a conservative, but I believe in property rights. The planning board and hearing examiner agree that all y'all in SOECA are crying wolf because there's a 12-story apartment building in your backyard. So if someone wants to buy property in your neighborhood and build townhouses, and the county planners says it's okay, then so be it. We're kind of both right. The council voted to affirm the hearing examiner's recommendation to downsize the original EYA proposal. I think it's important to point out that the neutral hearing examiner found that the original EYA plan put too many townhouses on the site. Of course, the hearing examiner did not agree with the neighborhood's position either. I hope this case is an exception. We need to protect the single-family neighborhoods in the down county area while at the same time supporting a mix of residential and commercial in the business areas. We also need to make sure that the down county area continues to be served by churches, nursing homes and other service institutions. I am afraid this decision might encourage some of them to sell and move out. Dan, it great to believe in property rights. EYA bought 5 acres with the right to build single family homes. That is their right of property - nothing more. Presumably other potential bidders for the property were operating under that assumption. Neighbors bought their houses with the belief that the Chelsea school would, at most, hold single family homes. That's what the county had decided was the correct use of the land. EYA, as they can, is trying to get more than they paid for. Worth a shot I would say - but why is the county willing to go along with this? Favoring one corporate person over many other "real" people and infringing on their property rights is what is causing the anger here. You're right: property owners are given protections against things that would affect the use of their land. But I'm not sure why townhouses harm your property rights. It's not a factory belching chemicals, or a new highway, or a skyscraper that blocks the sun. It's houses, just like yours, except with common walls. It's still a residential use. I'm not clear how this affects your property rights. Dan, I count myself as older (by the minute!) and have made not one but three of the largest purchases of my life in Seven Oaks. Three houses in the past 17 years within 2 blocks of the site, moving as my family expanded. There are many of us in the neighborhood that completely support higher density. It is distressing that we lost 2 MPDU's to the drama of SOECA as evidenced by the comments above. Please folks, if you want everything to stay just as you envisioned it for the rest of your lives, this is not the place. This is exactly the kind of project we have the responsibility to support. And the county should be ashamed that they let a small group of people lower the density and reduce MPDU's. Liz Brent. Resident and yes, I'll point it out before someone else jumps to do so, real estate agent. "It will dump up to 120 cars into a quiet residential neighborhood" "it will create an imperviously surfaced heat trap where there is now grass and trees"
I'm sorry, but it is just embarrassing if those are the arguments against the project. HELLO, it was a school - the site is currently two large buildings and a giant parking lot! Its current use is the situation in which you see 2 massive heat islands and 120 cars dumped on the street at the same time, not the EYA proposal! Not to mention it's flanked on 3 sides by a large retirement community structure/parking lot, a massive apartment building, and SFHs that are zoned for commercial use along a major road (Cedar). Of course the community should have input on the design/use of the site, but SOECA has long since lost all credibility on the issue in the eyes of most everyone. As someone who has lived across from the Chelsea School for the last 12 years, I can tell you that you are wrong regarding the current traffic and site situation at the Chelsea School. Traffic to and from the school has a minimal impact on our neighborhood. It is generally restricted to two time perionds: when the employees and students arrive, and when they leave. By the time most of us get home from work, the cars and buses are long gone. Moreoever, except on rare occasions, there is no school-related traffic on evenings, weekends, and holidays. 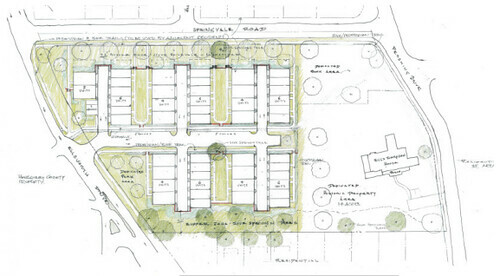 By contrast, EYA wants to build 63 townhouses with two-car garages. This will create significant new traffic, at all hours, all days, on what is now a quiet street. Were the site to remain R60, then, after deducting the environmental setting of the Riggs-Thompson House, there would be roughly two and half times fewer new cars letting out into our neighborhood. You also are wrong about the environmental impact EYA's plan will have. They propose to cut down 77 trees, many of which are old growth and very tall, with huge canopies. Whatever decorative trees they plant will not reach such heights, and it will take decades for them to mature. The negative effects of this mass destruction of trees on our air and water and soil, as well as noise pollution and screening of downtown, will be terrible. Lastly, contrary to your last assertion, I believe that SOECA has done itself a great service in opposing this reckless plan. It has gained significant allies among other community associations and groups like Preservation Montgomery. SOECA members like myself who have been heavily involved in this struggle have learned a great deal about the development process in MoCo (and we've had our eyes opened to how dirty so much of it is), and I am happy to say that wonderful frienships have developed among the neighbors who have worked together these last two years. I am proud of my community. And believe me when I tell you that we will be ready for any new misguided development plans that might come next. We were told that we stood no chance of stopping EYA's plans. We proved the naysayers wrong by stopping EYA's first plan, and we will continue to do all we can to make this townhouse development as compatible with our neighborhood as we possibly can. Dan, what happened to Jean Cavanaugh's comments? I like to think of this blog as a place for relatively civilized discussion, including reasoned arguments based not only on fact but on some level of respect for others. I understand that emotions are running high about this proposal, and I realize that not everyone's gonna be happy with the solution. But complaining that people are "wrong" or "don't have their facts" or are "dirty" because they disagree with you is not only unhelpful but, frankly, rather childish. So that's why I deleted Jean's comments. I told her that I'm willing to accept a guest post from her if she can provide a reasoned, insult-free argument for her case. With all due respect, I thought Jean was polite and that she accurately pointed out the factual errors in your article. While I sincerely appreciate your desire to keep letters civil, I would note that some of the anti-SOECA sentiments you've left here are as vigourous, so to speak, as anything that Jean said. I think labeling me "anti-SOECA" because I disagree with the position of a handful of people in your neighborhood association made my point. I did not label you anti-SOECA, and I was not referring to anything you wrote. Okay, I'm done. It's a gorgeous Saturday afternoon and I'm not spending any more time at the keyboard. Mr. Gurwitz asserts that 63 townhomes will cause traffic at all hours because each has a two car garage (strongly implying that each Townhome's occupants will have and use two cars rather than public transportation). Mr. Gurwitz testified before the hearing examiner and, ironically, in cross examination admitted that both he and his wife frequently use metro to get to/from work and leave both of their cars at home. This is part of the public record, not my opinion. How then can Mr. Gurwitz or anyone rationally claim that the new owners of the townhomes will be driving everwhere and "dumping120 cars" into the neighborhood? People will buy these townhomes because they can walk and take public transit frequently--just as their across -the-street neighbors, the Gurwitzes, do all the time. I can't believe you deleted Jean's comments. They were cogent, thorough and well documented. Is it your policy to delete all posts that do not agree with your position? Eesch. So this blog only wants to hear one aspect, a supportive one, re: given issue? I for one, would have liked to have heard what Jean had to say, she is President of one of the civic associations you mentioned, and likely speaks for more than herself ~ and for more than a "small handful." Doesn't being "President" carry a certain amount of respect that any blogger would want to uphold? As far as "property rights" sounds like all of this boils down to just that: If one cannot purchase in an area relying on the Master Plan and similar; then it makes all of our purchases shakey and unsure. 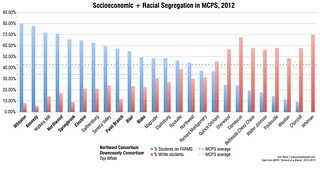 Perhaps one day, when Mr. Reed decides to purchase for his family and spends decades paying his mortgage, he might understand changes such as this (where traffic & lack of schools/similar may affect his children's welfare on some level). Allow me to set the record straight. There is nothing ironic about my having testified about taking the Metro to work. I also testified that we still use our cars to drive to stores, friends, and occasionally to work. I fully expect the townhouse residents to do the same. You should also know, having apparently read the hearing transcripts, that a neighbor testified that based on his quizzing of our street, my wife and I are the only two people who regularly Metro to work. Everyone else drives. Moreover, other witnesses testified that many of the jobs in our area are along the I-270 technology corridor or otherwise accessible mainly via the Beltway. As I expect you know, due to the one way restriction at the corner of Ellsworth and Springvale, the townhouse residents will most likely cut through our neighborhood to get to the Beltway. Also, given the right turn only onto Cedar Street from Ellsworth, they will cut through our neighborhood to get to Wayne Avenue and shops like Whole Foods and the rest of downtown Silver Spring. That is 63 townhouses-worth of cars, exiting onto Springvale Road, currently a quiet street. That is a significant change by anyone's standards. Do you recall, by the way, that EYA testified before the Planning Board that they had promised SOECA that they would not put a road onto Springvale Road? That they testified that the development would work with only one exit (and that was under the older, 76-unit plan, not the newer, 63-unit plan)? Do you recall my testimony, which was not disputed, that EYA is under no legal obligation to put a second exit onto Springvale Road, because under the law, given the number of units they propose to build, they are allowed to have only one exit? Incidentally, I am curious if you are same David Adams who is employed as a reviewer for the Montgomery County Development Review Team. No. It's my policy to delete posts that just say "you are wrong" without providing an actual argument. That's all I'm asking for. I'm sorry, but you don't know me and I don't know you. My life experience is not relevant to whether a development project has any merit. That Jean's fact based point by point correction of this blogs inaccuracies was removed, is indicative of censorship. She represents the Neighborhood perspective and I Am sure many in the blogosphere are interested to hear from resident, in their own words, that live in the surrounding neighborhood where this proposed townhouse development is proposed for a civil war site and on school land. In a civil society discourse and dialogue is respectfully administered, but the removal of the facts and truths from this blog, by voices from the affected Neighborhoods perspective - is a perspective this blogger can't tolerate. This blogger is undemocratic and his cowardice in censorship is evidence that the underlying issue is the blogger wants to dictate. I grew up in the Four Corners area of Silver Spring, having moved there in 1960 - probably before many of the commenters on this topic were even born. From 1985 to 2009, I lived in the Silver Spring part of the Fairland Master Plan area, so I know something about traffic congestion. I am disgusted, sick and tired of "traffic" being used as an excuse to prevent and hinder development and progres (even new development built by developers), and to promote a pro-stagnation agenda. Over and over again, the same entities and groups that use "traffic" as an excuse to oppose something (and everything) are also opposed to traffic solutions, including the InterCounty Connector (and yes, I know the ICC runs noplace near this project) and improvements to U.S. 29. Dan is one of the better observers of the East County scene, and I very much resent comments about his age (and other irrelevant and personal attributes). How is this smart growth? Putting density and walkability near transit is the core of smart growth. Taking land within walking distance of the downtown and the metro stop and zoning it for some denser and more walkable is exactly what smart growth is all about. This may be hard for detached single family owners to grasp, but many people like to walk places. The kinds of people that buy townhouses tend to walk a lot more than people who own single family homes. Filling that land with a bunch of detached SFHs would cause more traffic than townhouse owners. Townhouses will deliver less traffic on our streets than detached SFHs. Many of the parking spaces mandated by the county will go unused. I have two parking spaces with my condo and only use one. I drive a car maybe a few times a month. I have legs. I use them. That's why I live here, and that's why other people in my generation live here (or don't, if they can't find a housing style they like -- a townhouse, for instance). People need to live somewhere. Stopping development does not stop people from having babies. If we don't put density within walking distance of the DTSS metro, people will build elsewhere. But those developments won't be walkable, causing more pollution, more sprawl, more traffic and more trees to be cut down. Opposing this development has the amazing ability to both be incredibly un-progressive and non-conservative. Progressives/liberals should love a development that will be good for the environment and get people out of their cars. Conservatives should love to see the market at work and want see zoning loosened, since zoning is at its heart a very non-market idea. Instead we have some NIMBYs who thnk that land they don't own is theirs. Who oppose a development because they don't want to deal with a few years of construction. I'm a homeowner in Silver Spring. I made a big investment in this community, and I fully support this development. We must build for the future. Younger cohorts no longer want what most of Silver Spring and Montgomery County has. The DTSS area lacks townhouses, and many younger home owners may one day like to go from owning a condo to a townhouse, but if there aren't any available they'll leave for other jurisdictions. The county would be committing a grave dereliction of duty if they do not let these townhouses and other walkable developments proceed. Dan, can you highlight the corrections that you made? I read this article when you published it, and I don't have any visual clue as to the corrections you incorporated. Full disclosure - I work for NPR, so this is something I talk about with them as well. Also: have you been doing some DJing for WXPN? When I make corrections, I usually do a strikeout over what I'd written before. For this post, I'll also put the new text in bold to be clearer. Unfortunately, I don't work at WXPN, but I enjoy listening to their music director, Dan Reed! I briefly thought about applying to work there, but I felt that my qualifications, namely having the same name, weren't good enough.